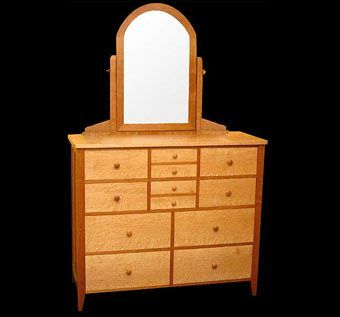 This Shaker-inspired ten-drawer dresser is made featuring highly figured bird's eye Maple top, drawers, and side panels. The tilting mirror and case are made from cherry. The piece is finished natural and measures 22" d x 50" w x 40" h excluding the mirror. The case and drawers are joined using either mortise and tenon and hand cut dovetails. The perfect combination of classic style and traditional joinery.